Delta sure is a fan of devaluations. They’re increasing the amount of miles needed for awards not once but twice this year, but apparently that’s not enough for the airline’s bean counters. The airline sent out an email to its flyers today announcing that it has created a new pricing level of SkyClub membership called Executive Membership that will cost $695 per year and will include access for two complimentary guests (as a regular membership currently does), while a more basic $450 Individual annual membership will get the member access but guests will cost $29. If you are an existing Club member, you have an Executive Membership for the duration of your current membership agreement. 1. Increase membership prices from $450 to $695 annually. Executive Membership will continue to allow two complimentary guests. 2. For those who rarely bring guests, beginning in the Spring of 2014 you can purchase an Individual Membership for $450 annually and you will be charged $29 per visit for guest access. 3. Beginning May 1, 2014, all customers who receive complimentary Delta Sky Club access as a benefit of their eligible credit or charge card will no longer receive complimentary guest access. A $29 fee per guest will apply. Delta justified these changes by claiming that they have invested $50 million in lounge renovations and their members have been complaining of overcrowding in the lounge – so naturally they’re raising prices for access! It just doesn’t make sense – and let’s hope the other airlines don’t follow suit. 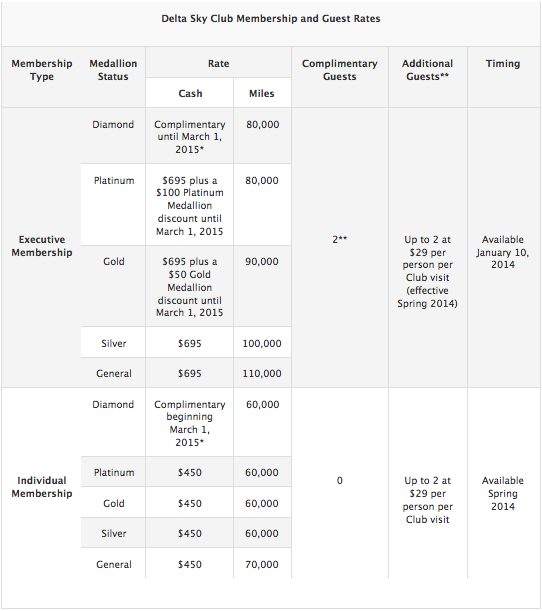 The New Delta SkyClub Fee chart. The other major blow is that, according to Delta, “Beginning May 1, 2014, all customers who receive complimentary Delta Sky Club access as a benefit of their eligible credit or charge card will no longer receive complimentary guest access. A $29 fee per guest will apply.” That’s a major blow not only to Delta Reserve cardholders, but also to cardholders of The Platinum Card® from American Express and The Business Platinum® Card from American Express cards. Previously, you could guest up to 2 other people in. That’s another big, negative development for the Platinum cards, which just last month announced that access to American Admirals Clubs and US Airways Clubs would no longer be a card benefit as of March 22, 2014. I am interested to see how American Express responds because they will really need to rethink the benefits packages of their premium cards and add some major new perks in order to keep them viable as good options in the travel credit card marketplace. Want SkyClub membership? It’ll cost you a lot more now! Having a club lounge is a nice perk to have, but let’s not get too twisted over this. From my experience, Delta SkyClubs aren’t that great. For instance, the only free beer is Bud Light and Bud, and the snacks are dry carrot sticks and hummus. I personally won’t be missing those much. In fact, when I travel domestically, I am usually operating on razor-thin time frames so that I have to spend as little time as possible in the airport and I don’t use lounges that much. Sure, they can be good for a hit of free WiFi or if there are flight delays or issues, but their usefulness can be pretty limited. If you are a SkyClub member, I’d encourage you to calculate the cost of these new memberships based on your visit habits, and if it is working out to something like $65 per visit, I’d suggest dropping your membership and spending your money elsewhere. Go to a nice restaurant at the airport instead and buy a top-tier Boingo WiFi package – in fact, that way you’ll probably have better, faster, more wide-ranging WiFi than the spotty club lounge WiFi usually is anyway! This is another reason I’m happy that I’m unwinding my loyalty to Delta, because it’s becoming clearer and clearer that flying with them is not about the passenger, but solely about the buck. Airlines are businesses, we get it, but at a certain point, Delta is going to cut away so many benefits that it alienates some of its most profitable passengers, and that can’t be good business. After all, loyalty goes both ways.